The ferret shedding season is here, and we have a few tips for you to keep things moving along. Like many domestic creatures, ferrets shed. They have two coats: an undercoat of soft, very dense fur that insulates them, as well as a topcoat of longer, thicker guard hairs that repel dirt and keep the ferret essentially waterproof. If you blow on your ferret, you will notice that the dark guard hairs will part so that you can see those light furs underneath. Most ferrets are white or cream in the undercoat and have markings in their outer layer, which gives them their distinguishing features, such as being sable or having a mask. Ferrets shed two times per year, in the spring and the fall. Because they are very photosensitive, keep in mind that your particular ferret’s shedding behavior is affected by its exposure to light, so he might not shed at the same time as another ferret kept somewhere else. During shedding, it’s a good idea to brush your ferret with a soft brush to help the process along. Bathing can also help, but too much bathing can dry the ferret’s skin and deplete natural oils, which can make shedding worse and increase odor when the oils return in full force. The ferret’s body is well-equipped to deal with shedding and in an ideal world, the hair will move through the digestive system smoothly. 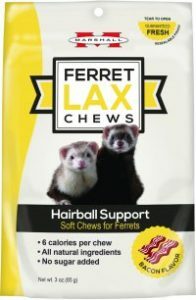 However, it’s a good idea to use a supplement, such as our Ferret Lax Soft Chews or our Ferret Lax Gel.